Somewhere along the way, being in the 96th percentile went from fantastic (He's healthy and growing!) to cautionary (Uh-oh, he might have a weight problem later on!). My kids have never been what you might call delicate. They're sturdy children with strong bodies capable of climbing trees, riding bikes, playing tag, and taking out the recycling. I love how comfortable they are in their own skin. Part of the reason for my own weight loss journey was to model positive body image behavior to my daughter. We're not trying to be skinny. We're trying to be strong. We don't need to lose weight, we need to gain muscle. We don't look fat, our clothes are having a bad day. Then, in one fell swoop, my message was lost. Torn away, in part, by their pediatrician. I didn't get to go to this appointment, but when I arrived to pick up the kids after work, I was informed by my son that he was "fat". I was shocked. I received paperwork from the doctor's office showing his growth charts. Stapled to them was page after page of portion control tips the doctor had reviewed in front of my children. "One serving of meat is the size of the palm of your hand." "One serving of cheese is the size of a die." The pictures, the phrases, and the ideas were all familiar. After all, I memorized them years ago the first time I tried Weight Watchers. But these phrases didn't reflect the language I want my children to learn. It was the language of diets. The doctor, concerned that Joseph's weight indicated he'd grow to be 6'2" and 220 pounds by 20 years of age, suggested we cut back on his portions. She advised that we increase his activity levels. She said all of this in front of a little boy who connected "watching his weight" and "over the recommended weight" with being "fat". The comments sent my mind spinning. On the balance, he already eats well and when I pick him up from his after school program, his hair is plastered to his head from sweat produced by a rousing game of Minecraft Zombie tag. While he does, admittedly, have a small bit of belly, he has the same growth patterns I've seen again and again in my male cousins — fill out, sprout up. I couldn't wrap my head around growth charts being used as a warning, a 12-year predictor of a weight problem (or even childhood obesity), not taking into account 12 years of healthy eating and playing sports. That night, we ate a dinner of chicken, broccoli, and baked sweet potatoes — a meal planned long before the doctor's information. Joseph pushed his plate away. "What's wrong?" I asked with a frown. "I need to stop eating. The doctor said I was getting too fat." He looked at me with worried eyes. I thought about how to reply. "Are you still hungry?" I looked at the plate that had barely been touched. He nodded. I repeated words I've used since they were babies. Then eat until you're not hungry and stop to let your tummy settle." "I'm done too," Elizabeth said. I looked at her plate that had one bite missing. "Because if I eat too much my tummy will fill up and poke out." "That's not how it works," I reminded her. I've read that eating disorders are beginning to appear in children. A part of me wonders if perhaps it has to do with "growth chart projections" at routine doctor's appointments, combined with an overactive imagination and a child's inabiltity to understand context. A good friend confessed to starting diets as young as nine after hearing her doctor describe her as overweight. My own childhood journals show an obsession with my weight as early as ten when I didn't conform to the mold of how girls develop. A cycle of bad relationships with food was born and it's only now, nearly 30 years later, being healed. We have an appointment to meet with our pediatrician in two weeks to resolve my worries and concerns, not over my son's growth, but over how it was presented. In the meantime, I'm doing my best to rectify what this one appointment has done. While I'm not certain if I can erase all of his worry, I'm hoping I can teach him not to let anyone — including his doctor — prevent him from being comfortable in his skin. I want him to understand that all of us grow at different rates and there is nothing wrong with that. 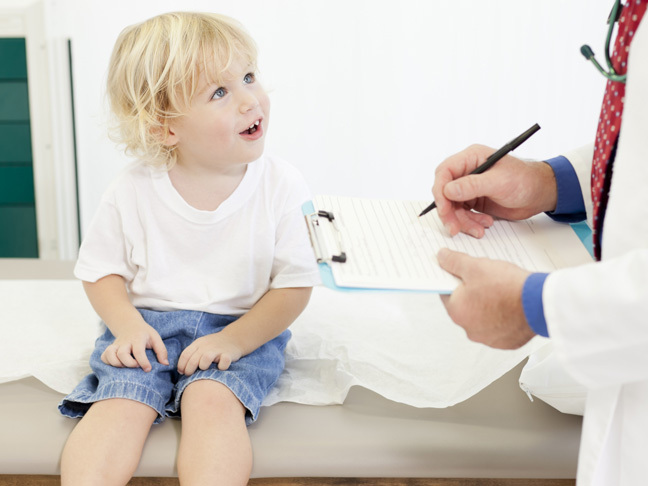 Has your doctor mentioned your child's weight in front of him or her? Sixth Infant Dies in Nap Nanny, a Product Recalled in 2013Does My Son Have ADHD? If So, What’s Next?